Hanukkah is a festival of lights. A celebration of freedom over tyranny. A great excuse to eat fried food (hello, latkes! ), play dreidel and enjoy holiday traditions. Some of those traditions are universal: The triumphant Hanukkah story is retold (of an ancient battle and a small amount of oil miraculously lasting eight nights). Prayers are spoken. Candles are lit. Dreidels are spun. From there, individual family customs take over. Happily, for many Jewish families, these customs include eight nights of silver-and-blue-swaddled Hanukkah gifts. Night 1: Family Activity Night. This could be a movie night, complete with sleeping bags and popcorn. Or tickets to a concert. Perhaps a brand-new family board game. The idea is to welcome the first night of Hanukkah with gratitude for the people we love. Night 2: Favorite Things Night. 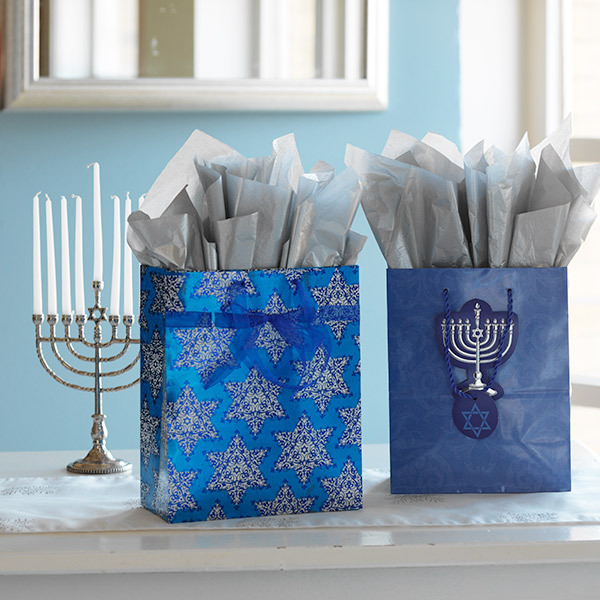 For the second night, each person gets a gift bag filled with things he or she loves: favorite music, lotion, snacks, gift certificates, magazines, chocolates, etc.—kind of like the Jewish version of a Christmas stocking! Hopefully, everyone will feel happy, loved and appreciated for exactly who he or she is. Night 3: Handmade Gift Night. The third night honors family with anything made by hand, which could include cookies, knitted scarves, handwritten letters, kids’ art, bookmarks and jewelry. Or even little handmade gift cards promising to shovel snow, give a foot massage, clean the garage, take a kid roller-skating…anything given more from the heart than the piggy bank is appropriate. Night 4: Get Cozy Night. The fourth night is all about the blessing of being warm and comfy. Ideas include new jammies, warm gloves, beautiful sweaters, stuffed animals for the kids, flannel sheets, gourmet hot chocolate, slippers—even a cashmere blanket or flat-screen TV. Whatever fits your budget, whatever makes you feel all cozy inside will work. Night 5: Tikkun Olam (Hebrew for “repairing the world”). This is a night to do something for someone else—an act of kindness that will make the world just a little better. Take a meal to an elderly neighbor. Serve at a soup kitchen. Collect coats and blankets for a homeless shelter. The gift on the fifth night is the goodness of doing for others. Night 6: Book Night. Gifts for the sixth night are favorite books, and the evening is spent reading and being together with the flicker of Hanukkah candles nearby. Night 7: Laughter Night. Gifts on the seventh night are chosen to make people laugh. Funny DVDs, framed old snapshots, silly toys, comic books, gifts with an inside-joke quality…whatever brings in the light of laughter works great. Night 8: Hidden-Gift Night. The last night of Hanukkah can be any gift at all! The fun is in finding the gift itself—using clues, treasure maps or warmer/colder hints (“You’re getting warmer!”). This is a great, happy way to conclude the holiday. However you celebrate, Hanukkah itself is a sweet, beautiful winter gift. Make it your own by creating new traditions and honoring old ones. Large gifts or small gifts, many or few—here’s wishing you a bright, lovely week filled with the ultimate bounty of love and togetherness. Though Hanukkah is a minor holiday in the Jewish year, its proximity to Christmas has heightened its gift-giving tradition, especially in the United States. The old European custom of giving Hanukkah gelt (coins or money) is still around, but the current trend of giving actual gifts really took shape in the 1950s. Looks like a trend that’s here to stay!